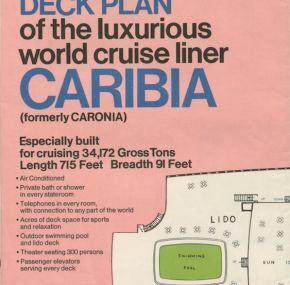 Exceedingly rare deck plan for the Caribia. Almost nothing ever shows up for Caronia’s abortive attempt to be a flag-of-convenience cruise ship. She only completed one cruise, and that was a disaster with massive amounts of guest complaints. 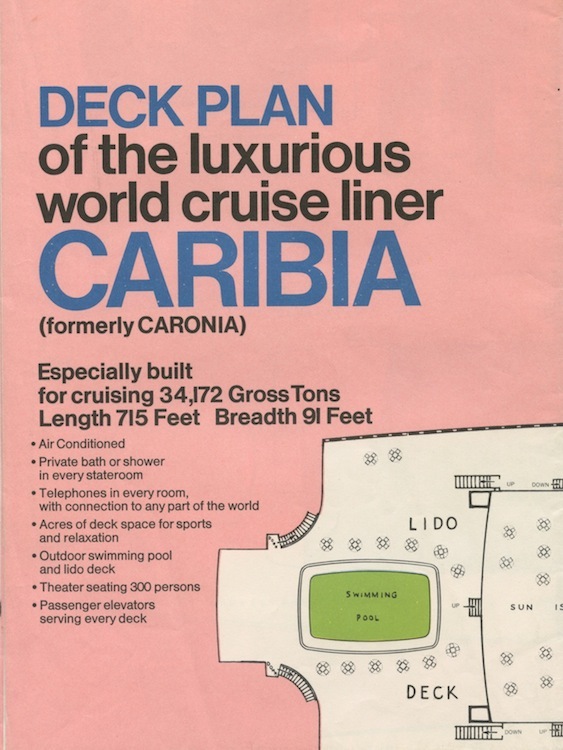 It appears that, to save money, Universal Cruise Line used the standard old Cunard deck plans for the ship and had them printed up with her new name and new deck names. Very little else is changed. When opened, measures about 37” x 24½”. A single crease in one corner otherwise near mint condition with no tears or pin holes. Grab it while you can because finding another will be tough!